﻿ The Ellen Staff’s ‘Bachelor’ Recap: Five Women Down, Seven Women Remaining! The Ellen Staff’s ‘Bachelor’ Recap: Five Women Down, Seven Women Remaining! Ellen’s producers recap this week’s episode of “The Bachelor,” and break down what happened in Vietnam, including the two one-on-ones with Hannah G. and Kirpa, the sparring group date, the five women who were eliminated, and the tease of a lifetime. The Ellen Staff’s ‘Bachelor Recap’: Hometowns, Dads and Drama! The Ellen Staff’s ‘Bachelor Recap’: Pageants, Pirates, and Pool Parties! 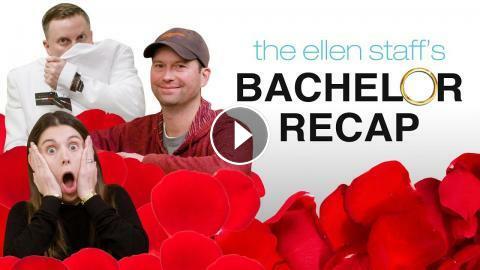 Ellen's Staff Brings Back the 'Bachelor in Paradise Recap'! Krystal Nielson & Chris Randone Spill the Tea in the Ellen Staff’s 'Bachelor in Paradise' Recap!